The Tsetserleg town is located in a beautiful forested valley in the Khangay mountains; it has a population of around 20,000, and is generally considered to be the most pleasant of Mongolia's provicial capitals. 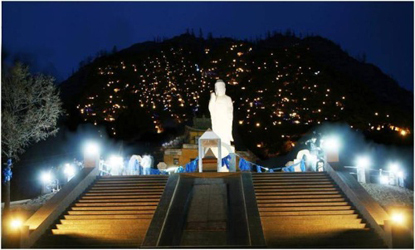 The Town is settled in the south of the sacred Bulgan mountain, which is worshipped and offered by candles and lights by town residents for traditional new year holiday and themountain looks very beautiful with shining lights. Arkhangai province is the home of many famous wrestlers and buddhism religion. There are some of monuments of famous wrestlers in main square and next to it, there is ancient buddhist monastery Zay gegeen. 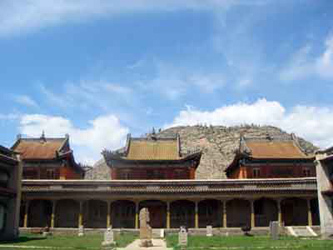 Now the temple hall is used as a provincial museum and it presents the history and feature of the province: the tallest men in mongolian history, the big numbers of yak herds, famous buddhist monks and so on.. Zay gegeen was a famous buddhist monk, who built this temple in present location. Arkhangai beautiful province is recommended for hikers, home stay takers, horse riders, mountain cyclers, rafting and trekking groups. Tsenkheriin Haluun Us - Blue Hot Spring is located in Shiveet Manhan Mountains' foot in the Khangia Mountain range, in the distance of 22 kms from Tsetserleg town. Different ancient people, like the Huns and the Uighur, settled here commencing in 3B.C. So around this area you can find many of ancient burial mounds and graves in different shapes. This hot springs sprout directly from the mountains and reach high temperatures of up to 86 degrees Celsius. 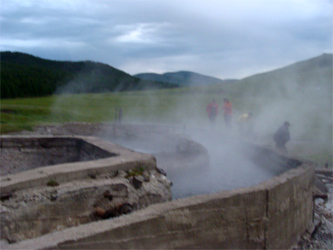 The hot spring is 25 km south east of Arkhangai province, 22 km south west Tsenkher village. The hot spring contains the simple alkaline structure of Sodium of Sulphuric. Walking along the Shiveet Manhan Mountain, you will see the main resourse of the hot spring: hot air and hot water comes up from the deep ground well and it makes someone the feeling that big hotpot (active volcano) is working under the ground. 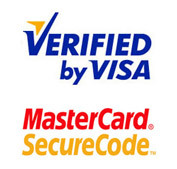 Around these area there are several tourist camps, all of which offer hot spa and health spa. This health spa offers for tourists indoor and outdoor baths. Sometimes in tourism peak season there some traditional massageurs and traditional medical doctors offer and consult their services to visitors. 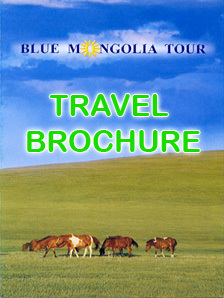 Around this area there are some nomad families, who can offer you horse riding. Gol Mod Archealogogical place is one of the famous and significant historical remains in Asia and Mongolia, that tells us about the ancient Khunnu people and lifestyle, who were living in present Mongolian territory by 3BC-1AD. They can be recognised as Atilla King's brothers and they always attacked to chinese tribes and they made Chinese to build a great white wall in 221AD. The Gol Mod area can be divided into 2 main areas and 2 separate teams are holding the archealogical excavations and they are trying to understand what level of culture and lifestyle the Khunnu people reached and what is their main. Gol Mod-1 area is located next to the sandy hills and forestry hills in Khanui bag of Khairkhan village at the altitude of 1600m above see level. In 1896 Dr.Talko Griintsevich, in 1956-58 Dr.Dorjsuren excavated some part of this burials and a professional team of French-Mongolia scientific expedition continued the research and excavation in this area since 2000. The main burial mounds are consisted of 400 small and big sized graves and the main noble grave was researched for 5 years. The noble man's graves are square shaped, with 4 gates and 4 corridors to the main ground hall; and main body is buried in the deep of 15-18 m, next to the body there are several items: horse cart, horse items, saddle for horse, bow and arrows, some porcelain cups and pots, some hanging staff and accessories with gold and silver carving of animal shapes and so on..
Gol Mod-2 area is discovered by a big team of scientists and teachers, students and engineers, which is lead and managed by Ulaanbaatar University's Social Science Department. The 2nd area is called Balgasiin Tal of Khanui bag of Undor Ulaan village. Approximately 200 ancient graves are determined and obviously, main big graves for noble man and other accompanied royal graves are excavated and archealogical findings are taken tot he laborotories and musuems for detailed search. The interesting staffs from that area are: vases, copper cauldrons, skillfully designed glass cups and dishes, jevelries with shape of antelopas, tigers, dragons and so on.. and cipper mirror, glass cups, which were made in.